DIY Computer Desk IDEAS – Today almost everyone uses computers for work or entertainment such as playing games or watching movies. For that, having the right computer desk is very important to support our productivity. When the need to have a computer desk is very urgent, people will tend to making rather than buying, especially lately the price of furniture on the market is very expensive. Although having a computer desk built by yourself can be a good way to save money, but it can be very expensive if it is made from quality wood. Small standing DIY computer desk idea like above is the best alternative to save your wallet and space. You can make it by using several pieces of wooden pallet that have been cleaned and painted with varnish. This DIY computer desk is perfect for those of you who live in a small room and need a space-saving computer desk. Its minimalist form can easily adjust places such as in the hallway or between beds. 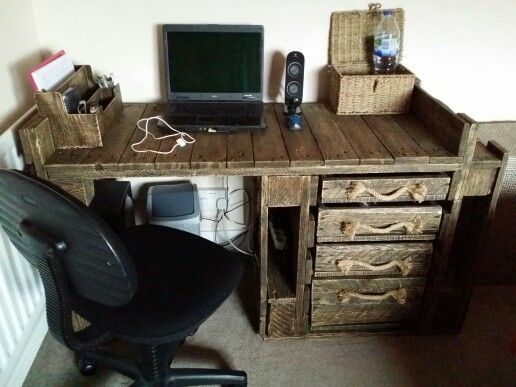 An old wooden pallet can be a cool DIY computer desk ideas in your room in the hands of creative people. There are so many factors that make wooden pallets as a great alternative to your computer desk, one of them because it is cheap and easy to use. You can also recycle an old wooden pallet in your home that is not used. A computer desk from an old wooden pallet will also add classic and natural look for your home decor. Despite its trivial appearance, but with a creative touch from the DIY wood computer desk ideas and the right steps you can turn this simple wooden pallet into a chic and ellegant computer desk. By using wooden pallets you can be free to be creative to mix & match your home office furniture colors with your own computer desk. If you consider yourself a artist or someone who loves artistic designs, there is nothing more satisfying than having stylish work desk to support your work activity. This is a best choice for your home decor, not only beautiful looks but also its a looks has a unique characteristics. This wood DIY computer desk gives a rustic feel while creating a fully modern and retro furniture space. Perfect for personal use at home or office for you an a architectural designers. Comes with several storage shelf and a table that can be set high-low will make it easier to work. Wooden palletes is among the favorite alternative when it comes to computer desk systems with minimum budgets. In such a situations, it will be very suitable and helpful for those of you who are young and full of creativity to building office start-ups. If you have a corner rooms with glass wall, then this simple computer desk is the perfect fit for the wall corner. it’s absolutly functionality and saving more space in your home office. To be more practical, provide several storage spaces under the desk that can be used to store your favorite books, magazines, or even your shoes. This simple, yet chic working desk is a good example DIY computer desk ideas. But you must be careful to choose the material sturdy enough to hold your computer and office equipment. Although having a wall desk doesn’t offer much convenience in use, it really helps to save your space. Having a black desk like the picture above adds traditional and rustic feel for your rooms. Unlike any general DIY computer desk designs, a traditional black corner computer desk can go without paints and can blend perfectly with the other colors of your home decor. Those who are looking for an affordable but efficient way to organize a home office should include pallet computer desk on top of the list. This is the simplest idea that you can complete in just a few hours. You can build it from three wooden pallets and with tempered glass on top to give you industrial office looks. This is a Creative DIY desk-building project that resulted in a modern desk with vintage touch. Neutral color shades from wooden texture are important characteristics of the rustic interior style. If you want to use this DIY computer desk ideas, keep the wood planks in its natural color to go with the style. You can also build a minimalist computer desk by joining two wooden pallets to make it looks wider. While constructing the design, don’t forget to sand the pallets to avoid getting splinters when it will be used. This is another example of the Creative DIY desk project as above. Besides its vintage value, another advantage you can get when using wooden pallet for your computer desk is an additional storage space. The wooden frame also serves as a hidden shelf to store your book and other computer accessories. Using some wooden pallets to make a office computer desk-group is a great idea because it will make it easier for you to interact. These wooden pallet models try to implement all of them with their functional and simple designs. Another benefits in addition to increasing the effectiveness of teamwork, this can make a sense to togetherness in your team. With just two planks of wooden pallets, you can make your own computer desk without paying tons of money and without losing function. Perfect for personal usage home or office with a small room and needs to come up with changes to make a room for your activities. Are you looking for a unique computer desk design for decorating your home? Yes, you can go with this crazy idea. Creating an attractive home office it will make you happy and make remain to be at your work a little bit much longer. As you can see from this image; if you are looking to spruce up your personal office space and want to get more space, this little wooden desk will great works to apply in your little workplace. Come with a simple-minimal design from upcycling wood, this not only help maximize the space but also can make easy to set up your computer and certainly also saves your cost. If you have home office that is completely made from wood, you can use wooden pallets for your computer desk, this will be very complementary. You can also be creative with it, like adding a few shelves to book storage on it. By adding a little bit of paint and varnish, I think it will look great. This is the best idea if you want save your cost with DIY computer desk, yet at the same time you need lots of storage room. By utilizing an old unused wooden pallet, not only get a minimal space-saving computer desk but you can also make it a place to store your books. If you are looking for a DIY computer desk with large space concept for your home office, you can go with wooden pallets for a corner table arrangement. Besides easily finding wooden pallets in the stores your area, you can also make portable shelves with wooden pallets on the side of the table to store more work documents, as and when needed. Related article : 25 BEST – DIY Pallet Bed Ideas | Bedroom Concept! If you are into classic rustic style, you can never go wrong with this DIY computer desk, because it uses wooden pallet to desk and some small iron as a desk support foot. Of course, you can make shelf storage on the wall or just put it in under left-right the table. This will also help you be more organized by storing and categorizing any document job you have at home. However, adding a wooden accent to decorate your room is the best choice and that works perfectly. You can going with this idea, especially if you want bring more work to put on your computer desk. To build this desk, you just need to provide four wooden pallets that have been cleaned and sanded. For the finishing, this will great to add varnished wood for your desk since it can create a shiner and clearer appearance. The best thing about applying DIY computer desk to your home design is that you can build a in similar style your home decor. You can go with a wooden computer desk painted in white according to the interior color of your room. However, this will require a bit of care to maintain the color to keep clean and smooth. Give your home office space a unique and classic looks with the use of wooden pallet desks. There are so many DIY computer desk ideas you can choose with wooden like the similar in above. You can also be creative with the design and style that you need, for example adding a few storage shelves to your things. This is a great ideas to combining modern – classic style in your desk. While sturdier pallets are used as the legs of the desk, you can build the desk using solid wooden planks. Both of them are complementary in style and will surely add more comfort to your work activities. This stylish abstract computer desk art uses some wooden pallets as its main feature. You can make it from five wooden pallets by overlapping and adding tempered glass on top to give you modern home office looks. These an example of a simple DIY computer desk made from a wooden pallet for personal use, one which has a clean, simple and quite modern look. If you want to go with this idea, consider adding tempered glass on top or making it to solid desk. This will make it easier for you to put small items on the table such as pens, rulers, etc. so as not to fall. Building a wide computer desk is sometimes very necessary for those of you who work with two people together. This is a simple project, especially if you have some old wood in your home and then you just need to find a handle for desk footwear. You can go to the hardware store in your place or you can replace it with something that resembles it. Black is among the favorite colors when it comes to make modern yet luxurious computer desk systems. For more practical use, leave some space under the computer desk like in above to add with several cabinets that can be used as your storage units. Hope you are inspired to begin your own DIY computer desk project after looking at some ideas above. Remember to consider its artistic and practical use when you choose pallet or wooden planks as the element of the main furniture in home office.